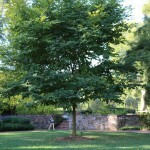 This forms a broad, rounded tree with bright green foliage. The fragrant white flowers are held on 12" long pendulous panicles in spring. The fall color is golden yellow. 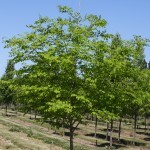 The wood contains a yellow dye which distinctively colors the heartwood and gives rise to the common name of yellowwood. It needs full sun and an average well-drained soil. Prune in summer as cuts made in winter or spring tend to "bleed".